Your little girl is wanting a more grown up doll, but which would be the best one to buy for her? The purpose of this article is to help you decide what are the most important features when buying a doll for your little girl. It’s the theory behind all of Petalina’s recommendations for this age group. The second article then introduces you to the most popular dolls for this age group which are between 45-50cm in size. We will look at suitable dolls in smaller sizes later. Something you may find helpful if you haven’t already done so is to register for an account on our website which will allow you to create a wishlist, a place where you can add all the dolls you like the look of and see them side by side. That way you can revisit the list at your leisure, compare them, remove some and add more until you make your final choice. How do girls play with their dolls? When a little girl reaches 5 or 6 years old, they are very likely to enjoy a more grown up doll with a similar physique to their own. The doll will become a companion during play and their day to day life, and many will also treat a doll as if it were their own little girl. A doll with a similar appearance in terms of their stage of development will appeal, because they can role play familiar situations such as mums and dads, going to school, visiting the doctor or hospital, attending birthday parties, having riding or dance lessons. Even re-enacting difficult situations, such as falling out with a friend. Role play helps children to understand and come to terms with what is happening in their lives which will make the same situation a little easier to cope with and react to next time. Doll play is also a great deal of fun and younger girls seem to really enjoy dressing up their dolls in clothes that they enjoy dressing up in themselves – party dresses, princess dresses and ballet outfits all come to mind! Two of Petalina’s little princesses with their Gotz Precious Day princesses. So sweet! As a child gets older they will use their dolls in all kinds of imaginative games. One customer once told me how her girls were pretending their dolls were off to university! Again, having all the right clothes for the dolls to wear in these situations adds to the game, and girls can have lots of fun making dolls clothes and accessories too. As well as experimenting with outfits, hair styling becomes more important for older girls. The appearance of the dolls becomes more important, just as it is for the girls themselves as they mature. It is often felt that having a doll with the same colouring (hair, eyes and skin) may help to build a child’s confidence in themselves and their appearance. ‘If my doll looks lovely and is just like me, then I am lovely too!’ So perhaps a first grown up doll could look like their owner, but a second or third doll could have different colouring to reflect our modern society and represent the diversity in friendship groups. The fine motor skills of girls of this age are becoming more developed so they will be able to manage dolls that require some skill to move the limbs and to dress them. So dolls with articulated limbs, rather than floppy limbs on a soft body, are recommended because they look more realistic and can be posed in different positions, which adds to the fun of play. For 6 to 8 year olds there are also a number of dolls which not only have joints in their necks, hips and shoulders, but they also have joints in their elbows and knees which give the dolls a more natural appearance and make them even more fun to play with. The most popular dolls for this age group tend to be between 45-50cm in size, but there are also several ranges of smaller dolls available too which are between 30-40cm. As a result of the popularity of the larger dolls, many manufacturers produce lots of different sets of dolls clothes and other accessories including horses and furniture, all of which build on the play value of the doll. 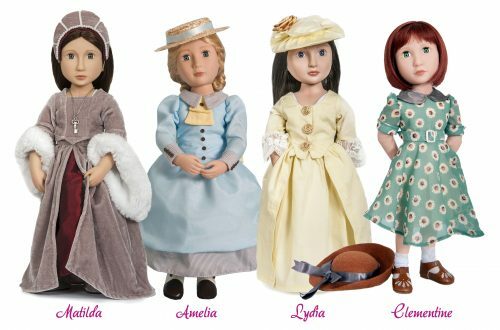 One of these dolls as a gift will also make present buying for family and friends very easy, as extra sets of dolls clothes and shoes are always welcomed by the girls! To ensure that any doll or accessory complies with the European toy Safety legislation, products should be marked with CE as in the image to the left, which means that the product is ‘certified european’. This is the mark that manufacturers put on their products to show that they believe it complies with European Toy Safety Regulations and can be freely sold within Europe. However, not all toys on sale in the UK for dolls comply with the requirements of European Toy Safety, so please be careful before giving a child a product without original packaging showing the manufacturers details and CE marking if applicable. Without an additional ‘not suitable for under 3’ mark (below left), one can assume that the CE marked toy is safe from birth, but there may be additional warnings on the manufacturer’s label or packaging. Always check this before giving a toy to a child and regularly check the toy for signs of wear and tear or pieces coming loose which may become a choking hazard. All of the dolls in this section are safe for the over 3s but none of them are suitable for the under 3s due to small parts that could be a choking hazard. Age – In this blog Petalina recommends products for children of particular ages because of the child’s physical development at that stage. For example, buying a 3 year old an articulated doll that is recommended for an older girl isn’t recommended. This is because the child may become frustrated because they can’t move the limbs properly and therefore find dressing the doll too difficult. The hair will also be very challenging to maintain, and the clothes too fitted and tricky to put on. The doll may not be cuddly enough or is too big and heavy to carry around. The consequence being that the doll is abandoned in a toy box and everyone will assume that the child doesn’t like dolls. When all that was wrong was that the child was given a doll that wasn’t appropriate for their age. Remember that this recommendation isn’t based on how advanced your child is, but on their physical capability and developmental stage. Hair type – There are two types of hair available for this age group – rooted and wigged. The hairstyles are always long because girls of this age generally start to take an interest in hair styling and the more hair there is, the more adventurous they can be! Rooted hair is securely attached to the head with a machine, which knots the hair inside preventing the hair from coming loose. Rooted hair is very tough and can be washed, brushed and styled. You can tell when a doll has rooted hair because you will see small sections of hair coming out of tiny holes in the head. Gotz children’s dolls all have very good quality rooted hair. From my own experience with my daughters playing with dolls, Gotz hair is really good quality and lasts well. Wigged hair is the more expensive option. The wigs are made of mesh and the hair is tied by hand onto it in rows. The wigs are then securely glued onto the doll’s head. You can tell when a doll has wigged hair because you may be able to see the mesh of the wig on the head along with all the rows of hair. Sometimes you will also see short strands of hair, which are the ends of the strands that have been knotted to the wig. This method allows the manufacturers to create a hairstyle with a realistic appearance that stay in place for much longer than rooted hair, where partings and fringes can become muddled. Wigged hair can be brushed and styled but care should be taken to ensure the wig glue does not get wet so washing should be avoided. Rooted hair, however, can on the whole be washed. See our buyer’s guide on the differences between wigged and rooted hair. Eye Type – Some of the dolls for this age group have closing or ‘sleep’ eyes but many of them have fixed eyes. Fixed or ‘inset’ eyes cannot close and tend to have a more natural appearance. They also have more eyelashes than closing eyes which can only have real eyelashes on the top section of the eyelid. Fixed eyes are the more expensive option. I always find it incredible just how much difference the eyes make to the overall appearance of the doll. The better quality the eyes and the more sparkly they are, the more attractive and realistic the doll. Body Type – All of the dolls have articulated joints so they can be posed, with some working better than others. Articulated limbs have joints that allow the limbs to be moved in all directions compared to limbs with swivel joints which can only move back and forth in a circle within the joints. Gotz make Precious Day dolls and Hannah dolls that have articulated simple limbs and Bonnie & Pearl dolls are lovely too. You can see in the picture below that the Precious Day doll has a soft fabric body which is more tactile and comfortable to carry about and take to bed. The Bonnie & Pearl doll in the middle has a vinyl chest plate which looks good in strappy dresses yet is still nice to cuddle. Hannah on the right is perhaps the most beautifully sculpted doll by Gotz but being all vinyl is better for slightly older girls. Some dolls also have extra joints in their elbows and knees, even their wrists, which give the dolls a more natural appearance and makes them highly posable. These multi jointed dolls can be tricky to pose and therefore are not recommended for girls under the age of 6. On the left is a doll from the Gotz Classic Kidz and Happy Kidz range and on the right is a slightly smaller Kidz ‘n’ Cats doll. Should I buy a doll that looks like my little girl? 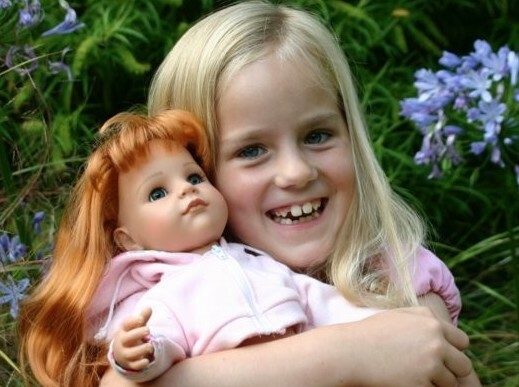 What better way to reinforce a child’s positive self image, than to have a doll that looks like them? Manufacturers produce dolls with many different hair and eye colours but there are still not many dolls available with non white skin tone. Do try and find a selection though because after the first doll, I think it is wise to have a mix of dolls with varying appearance to reflect modern society. 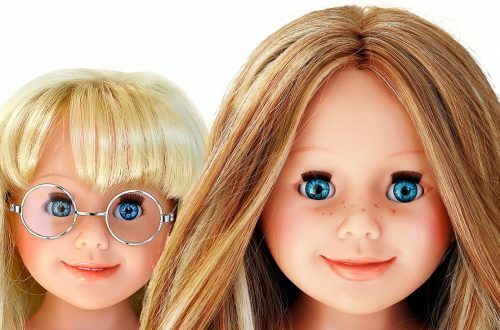 What will be the best type of hair for your little girl’s new doll? Rooted or wigged? Will she want to wash the hair? Is she old enough to look after a wig properly? What type of eyes would your little girl like? Is this important or not? Fixed or sleeping? What type of body would your little girl like her doll to have? Will she want to take the doll to bed? Or would she prefer a doll to look more realistic? Is your little girl old enough to have a doll with extra joints in the knees and elbows, or is this not important? I was sorry you decided to close your shop but completely understand. I wondered if you could assist, my eldest daughter is 3 1/2 and had asked for an interactive talking doll for Christmas, I wondered what is the best make / something also she can use for many years. I have 2 daughters and have bought from you in the past so know your dolls and love them , I was thinking of a Gotz??? Hello Amanda, yes, sorry I went and closed the shop! I do miss it sometimes but I don’t miss the stresses involved at all. At age 3.5 your daughter might find dressing a Gotz doll difficult because their limbs are rigid, unlike a soft floppy doll, so be prepared to give lots of help when needed. I would say Precious Day would be good because they are still cuddly, their eyes close and they can be washed in the machine when needed. Corolle is still difficult to find in the UK other than on Amazon, which is a great shame. For Gotz, the nicest people in the UK are KR Bears and Dolls. I hope you find something you are pleased with. I am looking for a good quality doll for my girls 5 years birthday, and hope you can help me reccomend one. She loves dolls and have 2 twins ma Corolle, and a Götz toddler Hannah which have been her best friends. When she was 3 1/2 she got an Our Generation doll from some American friends and have since collected a lot of clothes, furniture a horse (and an extra doll). However the quality is not that of a companion, they are more oversized barbies, so i have been looking for a better quality doll. I love götz Hannah and happy girls dolls but they are bigger and i would like for her to be able to use all har OG outfits. I hope you have a suggestion. Hello Amalie, thank you for your message. From what you have said then I think Gotz Dolls are still the best for her. They are high quality, the closest in size to Our Generation dolls and available in the UK. Maybe Gotz Precious Day dolls would be a good option because their feet are smaller and can share most of the OG shoes (but not the plastic moulded ones) and they are the same height, but their bodies are a bit slimmer to ensure they fit all the Gotz clothes designed for Hannah and Happy Kids to wear as well. This means that clothes with a fixed size waist by OG will be too big but most others should fit. Having said that there are always unexpected issues like the hands of Precious Day being too big to go into some Our Generation clothes. The alternative of course is to buy an American Girl because Our Generation were designed to be a more affordable doll than AG and their size is very similar deliberately. You can order American Girl dolls to be delivered to the UK , but I’m not sure if you can order directly on their website. When I ordered one for my daughter I had to ring them up. It is expensive to do though because shipping is expensive and when the doll arrives you have to pay the shipper a fee and some VAT. Make it worth your while and order some outfits at the same time to put away for the future.